Adding nutrients (plant fertilizers) will not cause algae! It is often thought by many aquarists that by cutting back aquarium fertilizers in a planted aquarium will reduce algae or solve an algae outbreak. This is not the case. By not adding your plant fertilizer, you are actually starving your plants from the essential components needed for healthy growth. If your plants begin to perform poorly then this leaves the window wide open for algae. So by not adding nutrients will actually make your problems worse! Poor circulation, thus not moving nutrients and CO2 to all areas of your tank. Excessive amounts of light, keep your lights to 8 hours or less. Not enough water changes, try 50% each week or more. You have a densely planted aquarium. You inject CO2 & have medium to high light. You are growing medium and hard catagory plants. If you have a densely planted aquarium, then you will need to supplement NPK to avoid starving your plants. It will also be very beneficial at this point to supply CO2 for your plants. More information on CO2 can be found under our plant care section of the website. We recommend using TNC Complete as your plant food, a complete solution for dosing Macro and Micro nutrients for the densely planted aquarium. See here. Dosing TNC Complete is simple; dose 1ml per 10 liter of tank water per week. Dosing can be increased to 2 or 3 times per week depending on plant growth, water changes etc. Micro nutrients are required in smaller amounts and should be supplemented in any planted aquarium. The most important micronutrients are: iron (Fe), magnese (Mn), chlorine (Cl), copper (Cu), boron (B), molybdenum (Mo), cobalt (Co), nickel (Ni). Without providing these your plants will start to show signs of nutrient deficiency such as holey leaves, yellowing leaves etc. Micronutrients are in all good plant fertilizers such as TNC, Easylife and Tropica fertilizers. If you only have a few plants and a high fish count then we recommend TNC Lite, a micro nutrient solution for lightly planted aquariums, 'low tech' aquariums or aquariums with a high fish loads. See here. Dosing instructions; 1ml per 10 litre of tank water per week. If plants show signs of nutrient deficiency, increase dose or use TNC Complete. The Golden Triangle illustrates the driving force behind plant growth. 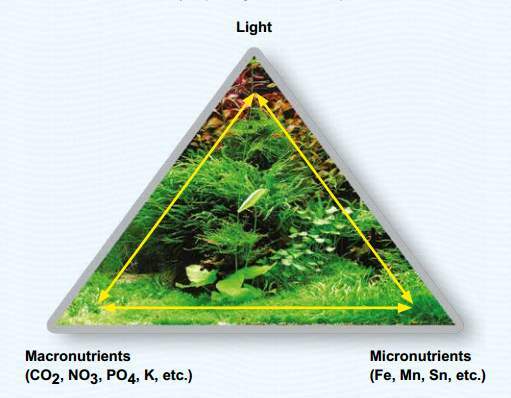 Light is at the top of the triangle and determines the demand for nutrients and CO2 by your plants. The more light there is, the more Macro and Micro nutrients are required for your plants to grow. Your plants will also grow much quicker under high light. When there's lots of light but not enough nutrients and CO2 in the water then eventually your plants nutrient buffers will run empty and plant growth falters. When this happens your plants start to pollute the aquarium water which activate algae spores and algae begins to flourish. Therefore, we need to supply all elements of the golden triangle in sufficient amounts to achieve healthy plant growth, whilst also hindering algae growth. It is important to change some of your water each week in your planted aquarium. This will remove excess amounts of waste and unwanted nutrients, mainly ammonia (algae love this). Thus, suppressing algae growth and helps keeps your plants & fish happy. By carrying out a water change you are diluting your tank water with fresh cleaner water, and therefore reducing the concentration of waste products. Should you encounter an algae outbreak, we recommend carrying out regular 50% water changes to remove pollutants from the water, whilst cleaning out any unsightly algae on your glass, wood and plants. Don't forget to dose your macro and micro nutrients again after any water change. Review your lighting intensity and CO2 diffusion and see if there is something that can be done to improve plant growth. For example, low CO2 levels are often a cause of poor plant growth resulting in algae.